The popular memory foam company has another high selling product on the market with the Brentwood Home 13-Inch Gel HD Memory Foam Mattress, a high priced solution that follows the company’s strict guidelines. It comes in a variety of sizes, sizes that are unavailable by many other manufacturers of memory foam mattresses. A big draw to this particular model is that it is one of Brentwood Home’s bestselling gel products to date, with sales still going strong. Consumers aren’t cheated and get the full gel experience, 3 inches worth of it in the 13 inch mattress. Several health benefits are available, including the cooling effect of fusing gel with memory foam which is shown to be more effective at keeping out heat than even proprietary airflow technologies in regular memory foam mattresses. All sizes and shapes will be comfortable and able to relax as the product contours and hits vital pressure points to ensure a restorative and uninterrupted sleep. It’s proven that sleeping on these types of mattresses leads to less movement while searching for a comfortable position. Backed by a long warranty and compressed and rolled for shipping, this is a great deal that no one should miss while it’s hot. Respected in the industry based on their quality products, buying from Brentwood Home is no different than buying from a big brand like Tempurpedic. Of course the cost is a lot lower, but the quality amazingly stays the same. Based in Los Angeles, CA the family owned business has been in operation for over 30 years, and has gained a rabid following of pleased clients all over the world. Each mattress has their own distinct touch that really is pleasing to the eye and the body once you relax in it. Materials used in the creation of their products are bamboo, organic cotton, wool, kapok, organic latex and soy wax. The all natural ingredients really bring out the best components in each product, and especially in the mattresses, buyers can tell there is a difference when laying on this memory foam compared to others. Their website is professionally done and up to date with a blog and vital contact info. Wait time is at a minimum, and the warranty they offer is very much backed, although very few have needed to use it. This is one of the more established companies in the market, and it’s always surprising to hear when no one has heard of them. Top notch due to their natural materials that they use in the process of manufacturing their memory foam. As one of their gel memory foam solutions, this 13 inch mattress does not suffer from a lack of gel topper at all. About 3 inches of the top is a gel infused hd memory foam comfort layer, beneath that is a 1 inch extra comfort layer, a 2 inch ventilated airflow layer and the base is a 7 inch therapeutic memory foam. Brentwood Home has it down to a science with the materials, and even without the gel solution this would be one of the cooler feeling memory foams on the market. Bamboo fibers comprise the materials for the cover that is easily removable, and because of the material it does a good job of wicking away moisture. This works well if buyers tend to sweat a lot when they sleep, so the cover will work well to ward away extra moisture so you have a more comfortable sleep. All products are made and manufactured in the USA. The queen size weighs only 53 pounds with dimensions of 80x60x13. Without a doubt the amount of gel memory foam they put at the top, when it would have been cheaper to add half the amount. The 4 layer mattress has most of its most important layers taken up by comfort and gel foam, so that is a telling sign of what users should expect with this product. The base is also stronger than expected, which is surprising since it is so soft and light. A big plus to their warranty program, which is not only easy to call in, but long at 25 years. There should be no worries about a potential breakdown in the product and if you’ll be able to handle customer support. The staff is very friendly and very quick to reply either on the phone or through email. Naturally anti-microbial, dust mite resistant, and hypoallergenic, customers can make an informed decisions when deciding if this would pose a health hazard for a person with allergies to chemicals. As a CentiPUR certified mattress, it was built from the ground up to be great in all households of any type. The last great feature is that it is fire resistant, something that will come in handy in certain homes. Serta’s iComfort Directions Epic would be the perfect comparison to this model, and the Epic runs around $3,000 grand brand new. This same bed only has 1 ½ of gel foam on the top, so that should be a serious indication as to how the Brentwood Home model completely spanks it in a comparison. Less than half the price and more plus, the Brentwood Home model has been the preferred choice for more customers over the last few months when deciding on whether they wanted to purchase a Serta iComfort Directions Epic. It’s almost insane how good a deal this is for consumers when comparing it to the big brands that cost thousands of dollars. There is of course some differing opinion with loyalist, but if buyers have a 6 bedroom house they can fill all 6 bedrooms with Brentwood Home’s 3 inches of gel or choose a single Serta 1 ½ inch gel to fill up one bedroom. That isn’t an exaggeration, the cost really has that big of a gap between the two despite the better comfort level from Brentwood Home. Brentwood Home is the company that offers a peaceful night sleep. There have been other products from the company that have gone down in price, but this particular one remains as a high priced option due to the popularity. Many people swear by this specific gel memory foam so although it will stay in stock, the price won’t go any lower anytime soon. The best bet for a sale is to wait when they come out with a successor to this one, but even then due to sheer demand it may stay in the high priced category long before there is a sale that slashes the price a bit. Is there really a big quality difference between a $3,000 mattress and one that is well below half that price? 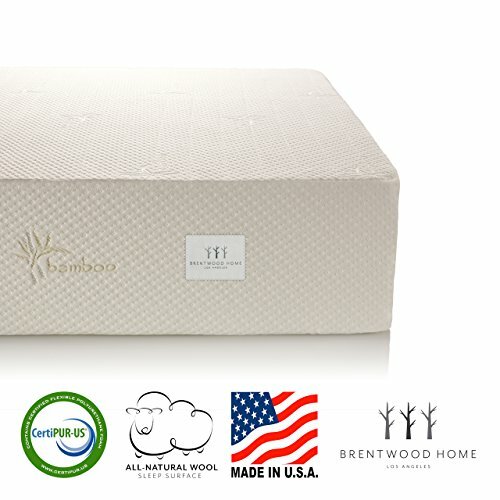 Consumers worldwide don’t think so, which is why this Brentwood Homes gel memory foam mattress has become one of their best sellers in the company’s history. Sales will continue to climb as people figure out which suits them best in the long-term. With a trial period being offered by Brentwood Home the plot thickens even more, as many memory foam hopefuls try out what is supposed to be the next revolution in sleeping. Chances are when they are done, they will end up purchasing even more from the same company.